served as a program director at NSF where he was responsible for the Operations Research, and the Service Enterprise Engineering programs. At NSF, he also headed the Cyber infrastructure planning activities of the Engineering Directorate. Concurrently with his appointment at NSF, he was a professor of Systems and Industrial Engineering at the University of Arizona. 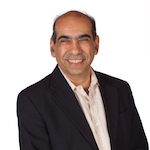 Professor Sen has served on the editorial board of several journals, including Operations Research as Area Editor for Optimization, and as Associate Editor in INFORMS Journal on Computing, Telecommunications Systems, as well as Operations Research. He is the past-Chair of the INFORMS Telecommunications Section and founded the INFORMS Optimization Section. Professor Sen is a Fellow of INFORMS. Applications (Infrastructure Systems: Electric Power and Markets, Telecommunications Networks, Traffic and Transportation) Optimization Theory: Large Scale and Stochastic Optimization, Integer Programming Applications: Infrastructure Systems, including, Cyber, Power, Transportation. 2014 Distinguished Speaker, Penn State, Texas A&M, and Invited Speaker at over 50 universities world-wide. 2014 Keynote speaker at International Conferences on Stochastic Programming (Vienna, Austria and Berlin, Germany) Service Systems (China), Infrstructures (India).